As a responsive innovation center dedicated to working in the community with others to create equitable education systems, it is imperative to understand the needs and realities of those we seek to serve. 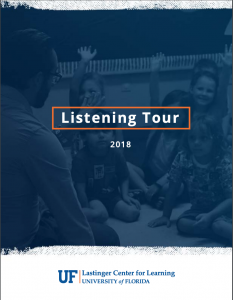 That is why last year I embarked on a six-week Listening Tour across Florida to hear from more than 100 educational stakeholders ranging from preschoolers to high schoolers, from teachers to school and district administrators, from parents to agency and organization leaders to elected officials, and from rural areas to urban centers. From conversations, heartfelt and sincere, we learned a lot. The conversations spanned early learning, literacy, and mathematics to leadership, technology, and school safety. The trip totaled nearly 3,000 miles and 20 of Florida’s 67 counties. The goal was to do a pulse check on the educational successes and challenges cradle to career in order to guide the work ahead both for the University of Florida Lastinger Center as well as Florida in general. Here are some of the themes that emerged from these conversations. Addressing students’ mental health and wellbeing is an increasingly high priority for Florida stakeholders, and it must encompass evidence-based preventive strategies as well as reactive interventions. There remains widespread support for standardized assessment in education, alongside growing recognition of the opportunity to reconfigure the accountability system to better incentivize evidence-based approaches to promoting healthy child development and student success. Across Florida, awareness of the importance of early learning is increasing; however, achieving the appropriate balance between access and quality continues to be a challenge. Increasingly, communities are recognizing the benefit of formally connecting middle and high school education to career readiness, especially those careers that align with Florida’s workforce needs. Educators are seeing the need for new interventions and supports for academically challenged learners who are falling further behind. Technology and data hold great promise for improving student learning, but greater capacity is needed both in schools and communities. Recruiting and retention of early and K12 educators continue to hamper progress in improving systems and need new more effective solutions. Superstorms, such as Hurricanes Irma, Maria, and Michael, are impacting rapid changes to Florida’s educational system and are likely to have long-term effects. Our full analysis on these findings can be found in the Listening Tour Report and will also be informing our work for the next three years through our Strategic Plan. Still, despite the power of each of the themes that surfaced from the Listening Tour, perhaps the most important lesson gleaned from this exercise is the incredible commitment, talent, and passion of the individuals in this state who serve our children. We should take great comfort and keep great hope knowing that Mr. Echevarria and Ms. Matheny are leading Fellsmere Elementary School in Indian River County, that Ms. Harding is teaching algebra at KIPP Jacksonville in Duval County, and Ms. Khrystie is caring for preschoolers at Building Blocks Enrichment Center in Suwanee County. It’s incumbent on us and those with whom we partner to develop a system and supports that allow them and, most importantly, the students they serve to be successful.